Have you been told to take creatine by a coach or your gym buddies, only to gain unwanted weight and/or spend waayyyy more time in the bathroom? In order to make your workouts more enjoyable, we've delved into the world of the best pre-workouts without creatine to bring you the top non-creatine options. This way you can still get the boost you need to crush your next session without worrying about the well-known side effects of this common frenemy. Why Consider Creatine in the First Place? Today there are many creatine-free pre-workout supplements that are becoming increasingly popular in their own right. 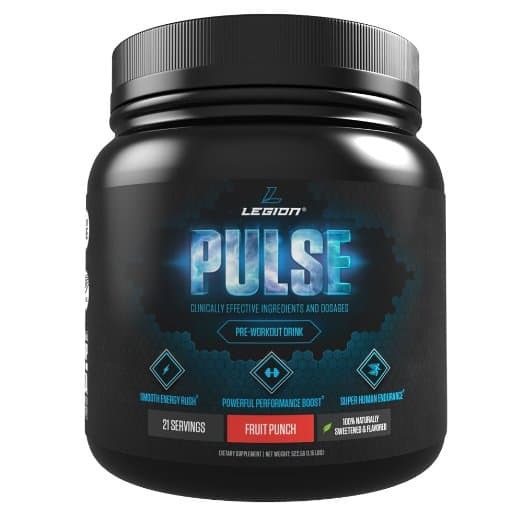 If you are seeking to take a healthy break from using creatine and still get ripped, Legion Athletics Pulse could be just what you need. As our #1 Pick, it will ignite your performance in less time. The ingredients in Pulse are advanced and dilate your muscle tissue so that you can maximize blood flow. N-Zero Extreme is a zero sugar and zero creatine pre-workout that has only 1g of carbs. As a pre workout without creatine product, N-Zero has been designed to achieve lean muscle and improve your athleticism. The formula used in Cellucor N0 Extreme is now more comprehensive. It will stimulate the growth muscle mass and increase the rate of fat loss. Your pre-workout drink is definitely never going to be the same again! Note: This product is one of the more pricy options around, but we feel the quality is well-worth the extra price. This all-out sensory assault is one of the most effective pre-workout supplements on the market. Neon Sport Volt will give you an electrifying performance through powerful energy. It is powered by a stimulant that is ultra-high energy. Ingredients contain useful elements like Olive Leaf Extract and Caffeine. This product contains a high level of the non-essential amino acid, beta alanine, to support muscular endurance and improve performance. Beta alanine works to prevent lactic acid from building up too quickly in your muscles, which usually occurs in training. This way, this pre workout supplement will allow you to complete your workout harder and longer. Whereas other non-creatine pre-workout formulas rely on nitric oxide boosters, this amazing product keeps these at a limit. Rather, the focus is on a set of goals that target power and strength during your workout. The pre workout supplement ingredients contained in Neon Sport Volt skyrocket your intensity, energy, and focus. Your energy gets amplified enabling your body to handle any workout, anywhere and anytime. Neon Sport Volt is the way to go! If pre-workout powder isn't your thing, try out these convenient pills! PumpPills is among the leading pre workout without creatine supplements available in the market currently. Unlike pre-workout powder, you do not need a shaker bottle or to carry around a big tub of powder. All you need are these small pills to create the burst of energy and greater performance. This product is a caffeine free pre-workout supplement that has all the needed ingredients for a powerful workout. PumpPills contains L-Citrulline, an ingredient that boosts your blood flow for optimal muscle growth. Other ingredients like malic acidic and beta alanine improve your energy and muscle endurance. Don't allow your pre-workout supplements to interfere negatively with your sleep! This quality product is a 100% stimulant free. This nitric oxide booster is ideal if you are a caffeine sensitive individual. With this pre-workout booster, you can take your pre-workout meal a notch higher today! The special ingredients contained in MUSCLEPRIME promote more intense concentrations during your workout. The outcome: increased power, strength and muscle mass delivery. This is due to its unmatched absorption factors. The branched-chain amino acid and beta alanine in this supplement are known to boost your anaerobic endurance and delay fatigue onset. MUSCLEPRIME is a really great creatine free pre-workout supplement that enhances the outcomes of each workout performance. MUSCLEPRIME is completely unlike any other non creatine pre-workout energy drink on the market today! MUSCLEPRIME brings energy and total focus to your workout and is known to directly activate your fat burning processes. Truly, AllMax Nutrition MUSCLEPRIME is in its own league! When you desire to put on size, this formula can do the job. It supplies vital energy that you require for training while helping in adding muscle mass to your body. However, it may not always be ideal for everybody. C4 Ripped with no-creatine contains key energy ingredients to help you push even through the toughest of workouts. The proprietary blend of ingredients contained in C4 have been designed to assist in mobilizing your body fat. This fat is turned into useful energy for your workout. The amino acids in this product plays a vital role in transporting your fatty acids for added energy so your body can get the job done. C4 Ripped is guaranteed to give you a desired burst of flavor and endurance you’ll love prior to training! Creatine is one of the most common and popular ingredients you'll see on the label of most pre-exercise supplements. It is also one of the most studied performance enhancing compounds, lauded for its use in building muscle mass, and is generally regarded as very safe to consume. Creatine is a natural nitrogen-based amino acid found in the muscles of vertebrates. Human beings are vertebrates! That means we naturally have it circulating in our bodies. The supplements marketplace is currently bursting with a myriad of creatine-based and creatine-free pre workout options. How do you know which one is for you? The basic premise of the perfect pre-workout mix is to provide you with stimulants and a nice energy boost for your training session. Since creatine is not a stimulant, there isn't really a need for it in the first place. Whether you opt for non-creatine or not, both types of pre-workouts still deliver results regarding your energy, focus, and pump in the gym. Taking creatine by mouth can cause side effects with the kidneys, liver or stomach pain and nausea. Therefore, some people like to use other creatine free pre-workout supplements. Upset Stomach - For some, consuming creatine leads to an upset stomach. This issue is largely genetic as to how you body can handle and absorb this compound. Renal (Kidney) Problems - if you have a history kidney issues or are taking a nephrotoxic prescription, you will want to avoid creatine at all costs. As concluded in this study, those with pre-existing kidney conditions have a higher risk of complete renal dysfunction and even acute renal failure. Weight Gain - Due to the mechanism of how it works to increase the flow of water to your muscles, you are prone to put on some unwanted water weight. Also, mixing creatine with a high intake of caffeine or certain medications, especially ephedra, is not recommended since the combination can cause adverse reactions. Taking creatine alone or with caffeine can cause upset stomachs and other issues in some athletes. If you are in need of completely non-stimulant options, see Health Listed's picks here. The following compounds are what separate the good pre-workouts from the great. Instead of trusting a "proprietary blend" be sure to really lead the label to identify the best formula for your needs. This has made it pretty hard to choose the best pre-workout without creatine supp with optimum nutrition for the greatest amount of energy, endurance, and strength to last your body through your workouts. Pre-workout supplements are proven to make all the difference when your workout starts. With a good product, your body simply doesn't tire that fast. Many women love them too! At the end of the day, you can finally look at your appearance in the mirror with satisfaction. While creatine can be a very useful supplement, not everybody will benefit from its vast advantages. As explained above, this is really not as a result of a problem with creatine per se but rather with how it is utilized. Rather, there is a small group of athletes who experience difficulties in properly absorbing products with creatine into the muscle cells. The reasons for this are varied, often related to genetics. Some of them also prefer having pre-workout foods instead. The best creatine-free pre-workout supplements can still deliver awesome power as you work in the gym. Therefore, if you can’t take creatine, have no fear. There are extremely successful bodybuilders out there who have attained great their status using non-creatine pre-workout products, such as our #1 pick the Legion Athletics Pulse.